December 9, 2011 10:20 A.M.
A new television series will be filmed in Northern Ontario. The production is helping to build the North's growing television and film production industry and will create approximately 200 jobs during filming. Ontario is supporting the project by investing in the 13-week dramatic series to be aired on TVO. Hard Rock Medical will follow a fictitious group of medical school characters as they train in Northern Ontario communities. Production will begin in early 2012 for broadcast in 2013. Investing in Northern Ontario's television and film industry is part of the McGuinty government's plan to create good jobs for families in the face of global economic uncertainty. Hard Rock Medical is loosely inspired by the internationally renowned Northern Ontario School of Medicine, whose identified staff will act as consultants for the production. A key component of the series will be Northern Ontario First Nations' culture in story content and through a training partnership being developed with the Weengushk Film Institute on Manitoulin Island. One of the Canadian production partners of Hard Rock Medical is Sudbury-based Carte Blanche Films Inc., producers of the television series Météo+ and a series now in production, Les Bleus de Ramville, both filmed in Sudbury with support from the NOHFC. This document was published on December 09, 2011 and is provided for archival and research purposes. Rick Bartolucci, Minister of Northern Development and Mines and Chair of the Northern Ontario Heritage Fund Corporation, announced an investment of $1 million from the Province in a new TV series called Hard Rock Medical to be set and produced in Northern Ontario. 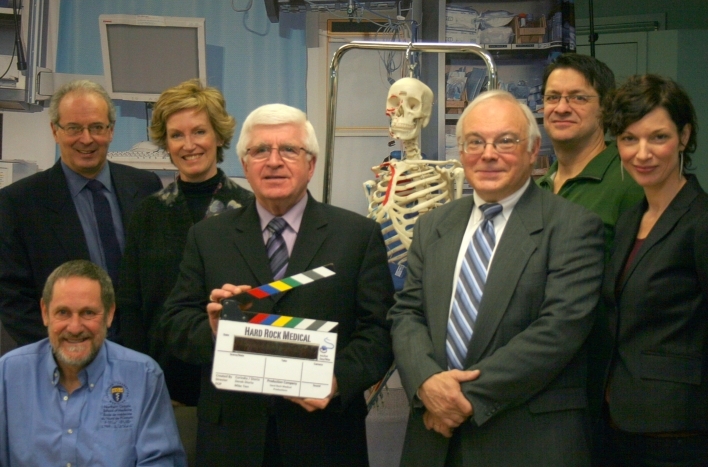 The minister (holding clapperboard) was joined by (left to right, standing): Mark Palumbo, President of the Board of Directors, Music and Film in Motion; Lisa de Wilde, Chief Executive Officer, TVO; Frank Taylor, Executive Producer; Derek Diorio, Co-creator/Producer/Director/Writer; Tracy Legault, Co-producer, all with Hard Rock Medical; and (seated) Dr. Roger Strasser, Dean of the Northern Ontario School of Medicine.